Legend relates that Joseph was chosen to be the husband of Mary because out of all her suitors, his staff bloomed. All of the staffs were left in the temple with each suitor hoping to be the one favored by Mary. The following morning, Joseph’s staff was budding into leaf when a dove flew up to heaven and he was the chosen one. Usually dressed in yellow and green, the colors of marriage, faith and faithfulness, fertility and regeneration, and hope, Saint Joseph carries his flowering staff with him. He also has associated with him the lily, for purity. He may or may not be crowned, but is always shown in a close, loving relationship with Jesus. Joseph underwent a transformation from an old man to a young man during the fifteenth-century. Before Spain accepted Saint Joseph as a devotional saint, Mexico had already been the “chosen land of Saint Joseph” for several decades. The first Observant Franciscan introduced Saint Joseph to the native population, which quickly embraced him as the protector and guardian of the Virgin Mary and Christ Child. He was also declared to be the patron saint and protector of the Catholic Church by Pope Pius IX in 1870. 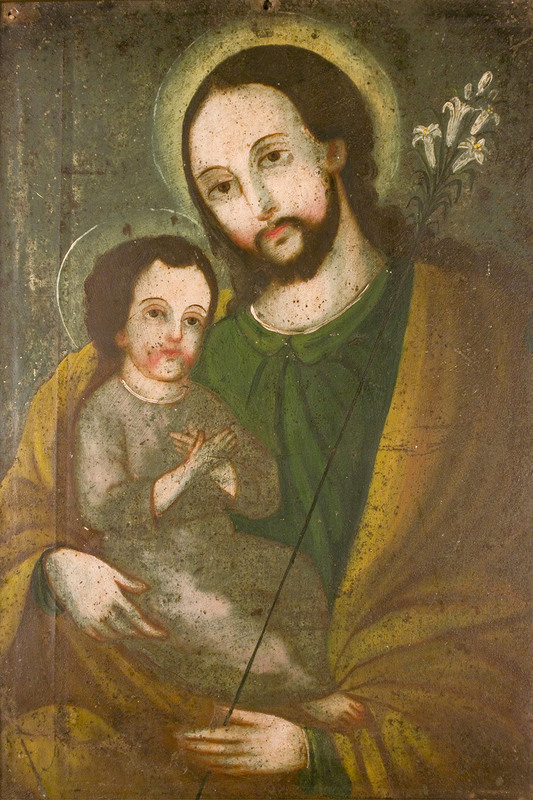 Saint Joseph is the patron saint of the good death, as Mary and Jesus were by his side as he lay dying. He is also the patron saint of carpenters, doubters, the homeless and is a safe refuge in times of spiritual and physical danger.